As technology progresses, there's typically an enclave of folks who like the old better than the new; witness record collectors in the age of mp3s, or mp3s in...the age of whatever iTunes sells you. 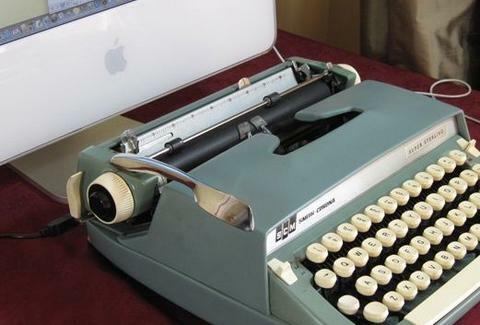 Giving a bit of old technology new life: USB Typewriters. 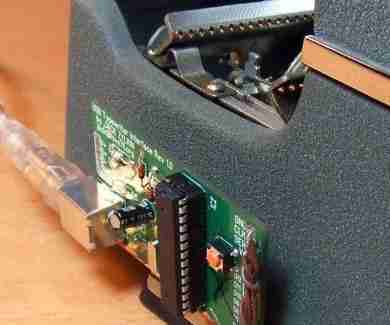 From Philly nerd collective Hive76, USB Typewriters're old-school manual key-bangers outfitted with fancy boards and chips to create a PC/Mac-compatible keyboard with an old-school feel/sound that'll make everyone in the coffee shop totally envy you threaten to tear it to pieces if you don't leave said coffee shop. The things work by mounting a row of sensors underneath where the keys hinge and firing an electrical charge through the chassis, as a processor mounted in the back employs hoodoo witchery timing calculations to tell the computer what just happened, eg, "that was R", also the most common phrase amongst pirate translators. Currently up for sale're a turquoise Smith Corona Corsair Deluxe, a light blue-gray big-bodied SC Super Sterling, and a dark gray Olympia Portable model, notable in its day for its chrome trim, and being considered "portable", despite weighing as much as the core of a star. They're also selling a couple DIY kits if you're willing to donate a typewriter and all the labor, although you'll probably have better things to do once your Napster pulls down Fugees: The Score.